Northampton boss Stuart Gray has signed former Wolves defender Gabor Gyepes until the end of the season. 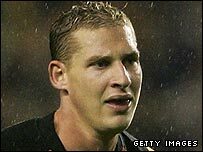 The 26-year-old Hungary international played 24 games for Wolves after moving to Molineux from Ferencvaros for £1m. His contract was terminated by mutual consent when he suffered a knee injury and returned to his homeland to continue his rehabilitation. "I know all about Gabor's quality from working with him at Wolves," Gray told the club website. "He's a big and powerful central defender who's a very good age. He was doing really well at Wolves until he got injured."